With a fresh layer of snow on the ground, there's nothing better than romping around in it — going sledding, perhaps — and coming back inside to a plate of warm cookies. 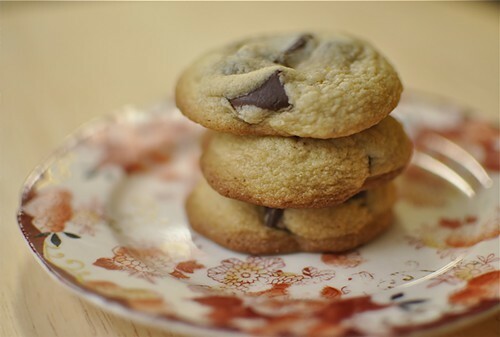 Every home cook needs a go-to recipe for chocolate-chip cookies; this one is mine. These thick, sturdy cookies can handle a healthy amount of chocolate, so I like to use chocolate chunks. Sift together the flour and baking soda in a bowl. In a large bowl, combine the melted butter with the sugar, brown sugar, vanilla and salt. Mix in the eggs. Stir in the flour mixture just until all of the dry ingredients are moistened. Add the chocolate chunks; stir. Let the dough chill in the fridge at least 1 hour, or overnight if possible. Preheat the oven to 375 degrees. Position the rack in the lower third of the oven. Roll out rounded tablespoons of dough and place them three inches apart on parchment paper-lined cookie sheets. Bake 9 to 11 minutes, until the cookies are golden brown at the edges. Remove the tray from the oven. Transfer the cookies on the parchment paper to cookie racks to cool completely before storing.